Jim Ysseldyke, Ph.D., is Birkmaier Professor in the Department of Educational Psychology, director of the School Psychology Program, and director of the Center for Reading Research at the University of Minnesota. Widely requested as a staff developer and conference speaker, Ysseldyke brings more than 30 years of research and teaching experience to educational professionals around the globe. 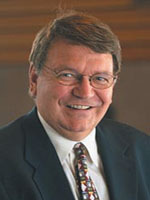 As the former director of the federally funded National Center on Educational Outcomes, Ysseldyke conducted research and provided technical support that helped to boost the academic performance of students with disabilities and improve school assessment techniques nationally. Today, he continues to work to improve the education of students with disabilities. The author of more than 300 publications on special education and school psychology, Ysseldyke is best known for his textbooks on assessment, effective instruction, issues in special education, and other cutting-edge areas of education and school psychology. With A Practical Approach to Special Education for Every Teacher, Ysseldyke seeks to equip educators with practical knowledge and methods that will help them to better engage students in exploring—and meeting—all their potentials.